ALOHA! 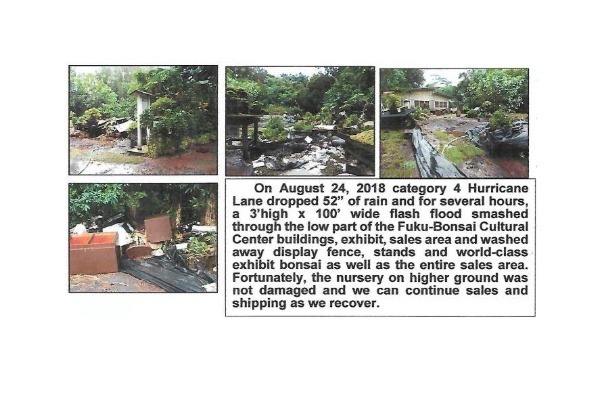 I’m David W. Fukumoto, president and founder of Fuku-Bonsai Inc. and “GoFundMe Campaign Organizer” for “SAVE-FUKUBONSAI.” With a heavy heart, I report that on the night of August 24, 2018, Hurricane Lane dropped a record 52” of rain that produced a flash-flood and caused extensive damage. AS OF FEBRUARY 21, 2019, WE HAVE COMPLETELY UPDATED AND REVISED THIS CAMPAIGN TO POSITION GOFUNDME TO PLAY A LONG-TERM PART OF OUR RECOVERY AND REBUILDING! 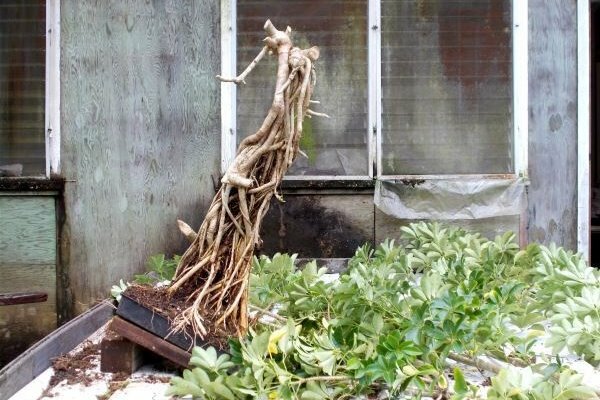 We will rebuild a completely new Fuku-Bonsai Cultural Center on an unused 5-acre high ground. Admission to the center is free, the Fuku-Bonsai website is free, and the monthly email FBnews will be free. We are committing to building TRUE INDOOR BONSAI™ and HAWAIIANITE™ communities. Both specialties are unique. True Indoor Bonsai is a totally different form of bonsai and increasingly it is being recognized as unique and the most successful popular form of bonsai for anyone, anywhere who can grow houseplants. HAWAIIANITE is also unique and the first safe, non-burning, citrate-soluble, high-phosphorous, on-demand universal fertilizer for everyone. Starting with Dwarf Schefflera, the most durable houseplant with ideal bonsai traits, we've develop a full progression of True Indoor Bonsai proprietary principles to produce large quantities of highest-potential bonsai! It takes 3 to 5 years to produce the highest success bonsai on the market. At 5 to 15 years the bonsai are developing rapidly and we release these at economical prices to allow study group members and customers to enjoy and improve them. After they are over 20 years in training, our Custom Collection are not cheap --- but they are the highest quality and value available on the Internet and you'll have a direct personal contact with the grower-creator to assist you if you have problems, or simply need a second opinion as you move to continually improve your bonsai. In creating our community, we don't want to create a costly bureaucracy, formal memberships, or to print and mail publications. The Internet is an ideal and wonderful mass community communication tool. But there's a HUGE amount of spamming that wastes everyone's time and our filters automatically identifies and trashes such spam. If you write to me and I don't reply within a few days, please write again as your first email may have been caught and trashed. We are working with Constant Contact to maintain our emailing list. To get notice of new issues of FBnews, go to our website and sign up on the Constant Contact opt-in/opt-out form. They will handle the mailing of the FBnews and that frees me from having to update the emailing lists after each issue is published. WE ARE REQUESTING AN ANNUAL GOFUNDME DONATION OF $10 IF YOU LIKE AND SUPPORT OUR EFFORTS! This makes sense for many reasons. Fuku-Bonsai went online in 1999, is one of the oldest and most respected bonsai websites, and has a greater volume of True Indoor Bonsai editorial material than all others combined! 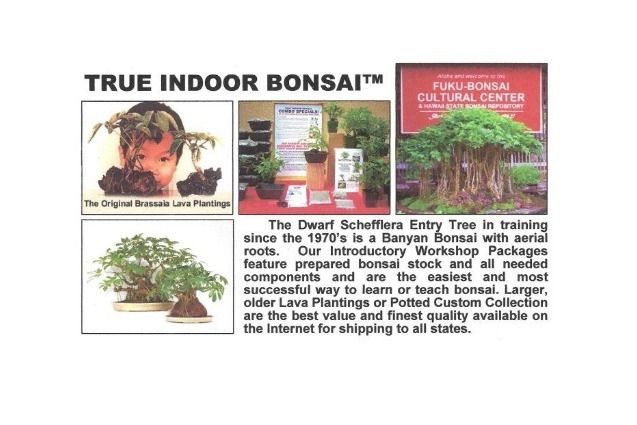 We've led the battle against the fraudulent use of the term: "INDOOR BONSAI." If you look up the horticultural characteristics of the plants offered under that category, you'll quickly find that most of the bonsai offered for sale are outdoor plants. Some may be temperate climate plants that need a winter dormancy for long-term health. Others require more light that in available in ordinary homes and offices. Outdoor bonsai don't miraculously become houseplants because you label them "indoor bonsai." In contrast, Fuku-Bonsai only grows the most durable houseplants that have a bonsai-like appeal. We supply those who want high success, an easier and more casual form of bonsai, and bonsai that can be given as gifts and handed down through the generations. We began shipping since 1973 and it is common to receive emails from those who have had our plants for 10, 20, 30, or even 40 years! We start training very young so there's a lot of character way down on the trunk-root buttressing. Without this, at worse, the best you can do would be like training a bonsai interpretation of a telephone pole! Don't settle for that! Fuku-Bonsai may be the only bonsai resource who is a certified nursery shipping to all parts of the United States the plants that we write about and teach! Every plant variety has a different cultural requirement depending upon the specific environment of the grower. Our Dwarf Schefflera is the primary exception as they will grow year around in most environments. I'm told that in Alaska and northern regions, interior heating kicks in when temperatures drop to 65 degrees F. In Arizona or southern regions, air conditioning kicks in about 72 degrees F. So year around temperatures are close to Hawaii for growing indoors year-around. Of course you may need to make adjustments. In Alaska you may need some supplemental light in their long dark winters. If the plants are in offices or buildings that are in cold regions that are not heated on weekends, our plants may suffer. But they can grow outdoors whenever night temperatures are above 55 degrees F. One day, Dwarf Schefflera will be the most popular bonsai. They are easy to grow, grow fast, can be trained into more styles than any other plant grown as gifts. They are easy to propagate and train and make great gifts even if the recipient doesn't have bonsai skills! WHY JOIN OUR TRUE INDOOR BONSAI AND HAWAIIANITE COMMUNITIES? Bonsai is a wonderful hobby and you can be very successful if you follow a few guidelines. First, start with the ideal plant that will grow well in your environment. Second, start with as much character as possible to avoid the most difficult five years while you have the least knowledge and skill. Third, learn to create good strong growth and keep in contact with the person who supplied the tree if you need help. Fourth keep learning and don't be bashful about asking for help! Here I need to add some details as I certainly cannot help every person in the world. BUT I TRY! Fuku-Bonsai is certified only for the United States. Some purchase in Hawaii, assume the risks, and hand carry them to other countries. Many past inspections and get through. Others obtain Dwarf Schefflera, read our website, and from time to time email for assistance. Many Fuku-Bonsai customers are happy to help others, to teach, are forming True Indoor Bonsai clubs, and allow me to refer people to them. Please contact me if you're in this category. I am 78 years old and we need to refinance, restructure, and reinvent Fuku-Bonsai to be a solid organization that can and will supply future True Indoor Bonsai and Hawaiianite generations. Hawaii is in the midst of a second major economic transition. After World War II, Hawaii shifted from a sugar and pineapple and in 1973, Fuku-Bonsai was one of the early Hawaii diversified agriculture industry pioneers that rather than commodities, created highest-quality, branded value-added products and direct niche marketed them by retail mail order and through Fuku-Bonsai Authorized Retailers. We sell out production without advertising. The limited wholesale allocation is snapped up by ten Hawaii retailers. Fuku-Bonsai's retail is larger than our wholesale and the direct customer contact has been the key to our continual improvements. Hawaii is again in the midst of another major economic transition with the development of two movements: The creation of "sustainable Hawaiian agricultural industries," and the creation of the Warren Buffet-Bill Gates "Giving Pledge," where billionaires are committed to provide grants or participate in financing unique companies that have the ability to create a better world and to scale up effectively. Our history of being the first Hawaii State Certified Export Nursery, production of branded products sold by niche marketing and the development of Hawaiianite make it ideal to start partnering with those who have committed to the "Giving Pledge." In the past Fuku-Bonsai has be under-funding, under-staffed and under-rated. With our ambitious plans and potential, I request contact and assistance from those associated with the Giving Pledge. Fuku-Bonsai is a closed corporation and with roots in a Fukumoto family hobby since 1962. We began bonsai just as Hawaii's unique Nisei (second Japanese generation) had returned from heroic World War II exploits, went to college on the GI Bill, and returned to reinvent Hawaii for opportunity for all. After establishing their careers, several leaders began to explore their cultural roots and Hawaii played a major role in befriending their war enemies and creating International Bonsai. Now as this Greatest Generation fades, Fuku-Bonsai is becoming the Hawaii keeper of the bonsai flame. The Fuku-Bonsai Cultural Center supports the concept: "Bonsai; a bridge for international friendship and peace!" It is dedicated to the entire World War II International Generation of idealistic community builders. Fuku-Bonsai is evolving into a B-Corporation with stockholders and an employee stock ownership plan (ESOP). 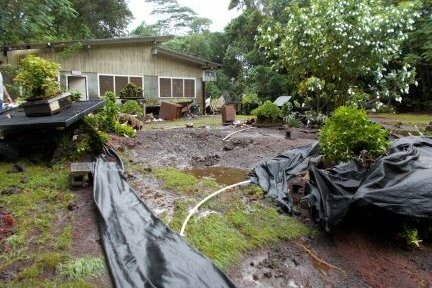 Hawaii is an expensive place to live, and to make possible the most competent future managers and leaders, we will move toward creating subsidized "agricultural village" housing, with supplemental non-Fuku-Bonsai income producing benefits. If you are committed to strongly supporting these idealistic goals for a lifetime, please contact me and request information about our "Fuku-Bonsai Management Trainee plans and program. Fuku-Bonsai was incorporated in 1985 to be the catalyst to create the Kona Fuku-Bonsai Center as a major Big Island visitor attraction in the then developing Kona-Kohala visitor destination area. The Fukumoto family traded all of the very profitable sole proprietorship Fuku-Bonsai property, improvements, inventory, assets and opportunities and became the sole stockholders. Through nine Private Placement Memorandums, this equity was joined by over $2 million in cash by over 200 mostly Big Island stockholders. This uncommon structure made it possible to survive the 1989 losses of over $30 million due to defective Benlate. We will be selling Fuku-Bonsai shares in $5,000 blocks. Please contact me if interested. We are surviving Hurricane Lane and the photos tell the story. Fate’s “double-whammy” hit us just weeks after starting the GoFundMe August 2018 campaign to complete our epic 29-year battle for survival after suffering over $30 million of losses due to the 1989 spraying of Benlate contaminated with weed killers and forced to seek Chapter 11 Bankruptcy protection. Between 1989 and 2007 we were in litigation against DuPont. The net total proceeds of the 1994 Benlate product liability and the 2007 DuPont fraud settlements after taxes and legal costs were less than 10% of our losses. DuPont used their overwhelming legal muscle to force tiny settlements. In spite of DuPont getting sanctions and their fraud already a matter of court record, they won and escaped paying for the damages they caused. This was the most egregious settlement fraud in the entire US judicial history. But none of DuPont’s officers went to prison. None of their attorneys were disbarred. Life is not fair, but we survived. 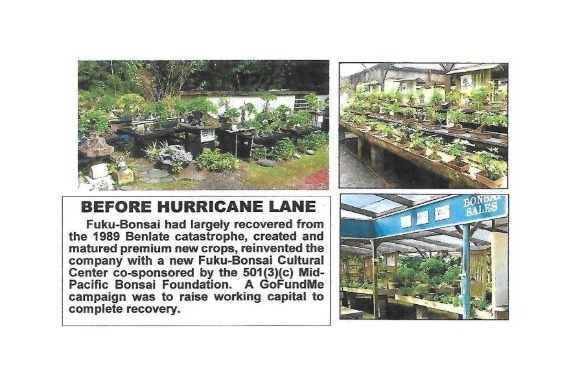 We paid all creditors 100% + interest, the bankruptcy was cancelled, we lost the first 17-acre Kona Fuku-Bonsai Center, and retreated to the Kurtistown nursery. First, we created easy-care Hawaiian Lava Plantings in four sizes and these today are the most successful gift bonsai for anyone, anywhere who can grow houseplants. In 2007 we made a major breakthrough with the Introductory Workshop Package (IWP) that was followed in 2014 with the Premium Introductory Workshop Package (PIWP). They feature pre-trained prepared bonsai stock and all needed components. Thousands have been shipped and they are the easiest and most successful way to learn or teach bonsai. Our Premium Potted Bonsai are now the best value and highest quality available. We’re the leader of “Nursery Bonsai” in which professional training, culling and grading begins while huge number of plants are very young. Those that do not meet minimum standards are discarded and only the highest-grade plants are upgraded to become larger, older highest quality bonsai. We produce several model standards with our oldest, largest Custom Collection now over 40 years in training and individually photoed and priced. Our True Indoor Bonsai™ will grow in homes and offices throughout the year and can be grown outdoors when night temperatures exceed 55°F. We are certified and the only bonsai nursery shipping to all parts of the United States with satisfaction and safe arrival guaranteed. We are fully committed to the highest bonsai ethical standards! We’ve cleaned up much of the debris and replaced phones, computers and office equipment. Temporary facilities allow us to continue sales and shipping. While we lost over 50 world-class exhibit bonsai, we are setting up an impressive new True Indoor Bonsai educational and exhibit collection. We will soon be able to again offer supervised individual or group workshops. Visitor counts are increasing. In the past, we received comments that their Fuku-Bonsai visit and workshops were the high-lights of their Hawaiian vacations. As we fully recover, we will be able to offer bonsai workshops to the 1,000+ weekly cruise boat passengers as well as convention group workshops. We may set up Fuku-Bonsai collections and workshops at West Hawaii hotel-resorts. We continue our commitment to grow for the future and make the Big Island of Hawaii an international bonsai Mecca! It is not prudent to rebuild where a flash-flood occurred and we commit to building a third Fuku-Bonsai Cultural Center on 5-acres of unused high ground to the scale of the first Kona center. Fuku-Bonsai will continue to be a closed Hawaii corporation committed to benefit bonsai, the Big Island visitor and agricultural industries, and the local economy. Our $2 million initial fund-raising goal will include a major evolution and we will move more into the public domain with partial employee stock ownership and large foundations, partners, and investors are invited. Please contact me for more information. GoFundMe will play a major role as we build integrated True Indoor Bonsai and Hawaiianite specialty communities. We decided against memberships and fees. The Fuku-Bonsai Cultural Center admission, our www.fukubonsai.com website, and the monthly email FBnews will be free and available to everyone. There will be a request for an annual $10 donation on an honor system with the donations to be made through www.gofundme.com/save-fukubonsai. To date, it is estimated that Fuku-Bonsai has shipped over 500,000 True Indoor Bonsai. As our FBnews emailing list grows, the $10 annual donation will produce enough funds to cover the cost of a webmaster and editors, and it is possible and likely that each FBnews issue will contain more editorial content and assistance than the quarterly magazines of Bonsai Clubs International or American Bonsai Society. Over time, donations will make the website and email newsletter an extraordinary True Indoor Bonsai and Hawaiianite resource and to build a specialized community to help all who are interested. Constant Contact will manage and distribute our growing FBnews emailing newsletter list. MeccaHosting will coordinate and support our original MSFrontPage website and a second website during the re-editing and transition stage. It will have all the capabilities of a modern website but with strong educational content and personalized assistance. The website will include the Fuku-Bonsai True Indoor Bonsai Handbook that will start with basics, be printable, and continue forever! Another section will feature linked Masterpieces of True Indoor Bonsai articles and photos. My hope is that others will join us and be able to carry on when my generation is gone. Our progress to date was accomplished with a lot of commitment, but with very little computer training. In November of 2014, we suffered a massive computer crash that ended almost two years of publishing the free Journal of Tropical & True Indoor Bonsai email newsletter. During that period, we made huge bonsai progress. We were able to resume email, but suffered another computer crash, then the August 2018 Hurricane Lane damage that caused further computer damage. When we tried to publish last year, a preview FBnews issue was posted at www.fukubonsai.com/2018.FBnews.FirstIssue.html We never got to send out notices as the server kept disconnecting when we tried to publish. Now in February 2019, I am humbled, happy, and proud to report that due to the help and support of volunteer individuals and companies, that we will soon begin publishing the FBnews again! The issue is up and being put together at www.fukubonsai.com/2019.FBnews.1.Jan-Feb.html If you have IT skills and want to assist, please contact me and join our advisory group. 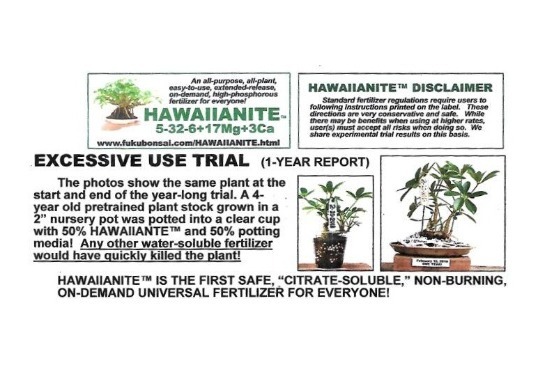 HAWAIIANITE™ is the end of a Fuku-Bonsai search for an optimum safe, on-demand universal fertilizer for everyone that eliminates the negative aspects of common water-soluble fertilizers that releases nutrients upon contact with moisture. Fertilizing is complex and beginners fail because they choose the wrong fertilizer, use too much, too little, none at all, or use it incorrectly. Hawaiianite™ is the first safe, all-plant, all-purpose, easy-to-use universal fertilizer for everyone. We completed development at the end of 2016 and have extensively tested it. It surpassed all expectations and we invite GoFundMe donors to run their own trials to determine whether it fits their needs. IT IS EASY TO USE SIMPLY BECAUSE IT DOES NOT BURN! That’s a major breakthrough. In theory, it would allow fewer larger applications and this would make it very cost-effective because labor is the largest cost item. It is necessary to cite the Hawaiianite™ Disclaimer. For most small plants in a 4” nursery pot, only a half teaspoon of Hawaiianite Coarse (5mm) applied basally will supply nutrients for a year or so. This is stated on the label directions for use. There are possible advantages of making larger applications but; in doing so, the user must accept any and all risks. Are the risks worth it? As an example, our large size lava plantings are the most successful gift bonsai for anyone, anywhere who can grow house plants. It combines an attractive sculptured lava rock with an older pre-trained bonsai. An estimated 5-year supply of Hawaiianite goes into the rock cavity, the bonsai is bare-rooted, root pruned, and rock-planted. It takes two years to complete training and have it fully established. When sold, there’s about a 3-year nutrient supply in the rock. In addition, we supply a complimentary nutrient packet with instructions. Even if the new owner ignores our instructions, the rock planting has a greater chance of doing well for a long while. This Fuku-Bonsai application exploits the non-burning trait. Hawaiianite™ has several other uncommon traits. It is the slowest release, low nitrogen / high phosphorous fertilizer that is especially suitable for all plants that flower. Phosphorous is known for abundant flowering, vigorous roots, and strong plants that go on to produce longer and larger crop yields. Water-soluble phosphorous is a major fertilizer run-off environmental polluter, but citrate-soluble phosphorous releases only tiny amounts as needed by the plant for a lengthy period. Low nitrogen balanced with high magnesium produce strong compact growth. The Excessive Use Trial one-year report follows. As a corporation with a working bonsai nursery, Fuku-Bonsai is the primary host and underwrites all costs of the Fuku-Bonsai Cultural Center in Kurtistown. Admission is free and visitors enjoy talking with our staff and learn our True Indoor Bonsai techniques and principles. The center, website and FBnews are co-sponsored by the 501(3)(c) Mid-Pacific Bonsai Foundation whose volunteers assist with the collections, grounds, and provide workshop assistance. FBnews is being developed to create a unique international community to be knowledgeable in our TRUE INDOOR BONSAI™ and HAWAIIANITE™ specialties. But rather than create a formal organization with membership dues, admission to the Fuku-Bonsai Cultural Center, the www.fukubonsail.com and FBnews informational resources will continue to be free. But on an honor system basis, we request a GoFundMe annual $10 donation by those benefit and support our efforts. The donations are requested to defray the costs as we build staff to generate specialty editorial information and assist future generations. Increasingly we are getting Constant Contact sign-ups from international readers. Although we are not now able to ship internationally, we are providing email assistance as growing Dwarf Schefflera with our techniques will make Dwarf Schefflera the most popular bonsai plant in the world. We hope that our True Indoor Bonsai becomes a bonsai bridge to international friendship and peace! Larger GoFundMe U.S. donors can request a tax deductible receipt by sending an email with their mailing address to david.f@fukubonsai.com or such donations can be made by check mailed directly to Mid-Pacific Bonsai Foundation who are increasingly taking on more responsibility in the “post-Fukumoto succession” plans. Fate has decried that Fuku-Bonsai whose have a unique “interesting” historical bonsai role. 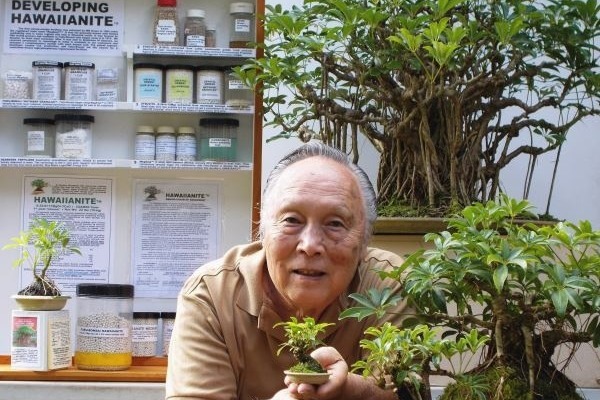 Begun as a family hobby in 1962, newlyweds David and Myrtle Fukumoto began when bonsai was largely a secretive cult. They supported early Hawaii bonsai education and organizational efforts and played a major role as Hawaii became a leader in creating International Bonsai for everyone. They led the development of “TRUE INDOOR BONSAI™” which is a major break-away from the impossibly difficult traditional temperate climate outdoor bonsai. True Indoor Bonsai now is the leader and the most successful gift bonsai for anyone, anywhere who can grow houseplants. As the only certified export nursery that ships to all parts of the United States, we promote primarily Dwarf Schefflera and besides being the leading informational resource, we assist and supply professionally grown high-potential bonsai that we supply, teach, and assist. As a fully vertically integrated specialist, we are setting the highest standards and invite everyone to join our efforts and become a part of our future. HAWAIIANITE™ compliments our bonsai but also has an exciting stand-alone international future! Having survived two major disasters, we are recovering, refinancing, and invite you to join us. For more information, please contact David W. Fukumoto, president & founder, Fuku- Bonsai Inc. & GoFundMe Campaign Organizer at david.f@fukubonsai.com MAHALO AND ALOHA! On this Thanksgiving day, I humbly and gratefully thank everyone that donated and is associated with this GoFundMe campaign that began in August. I regret to report that on August 24, 2018 Hurricane Lane dropped a record 52" of rain on the Kurtistown watershed which produced a flash flood 3' high x +100' wide that slammed through the lower center for several hours! It tore through buildings, washed away the sales greenhouse and sales inventory, drowned phones, computers and all records, and slammed through the bonsai exhibit with multi-million losses of world-class bonsai! I donated because David and his trees are an irreplaceble treasure. Just a small donation however I hope this helps and I totally hope we will get enough to create a revolution! A‘ole pesticides! Such a shame! I donated because David gave us a fantastic tour and story.